Quarter sawn white oak wood is known among solid wood furniture for its durability, strength and firm texture. We receive a lot of questions about it. Why is it called quarter sawn? What type of furniture is it best for? What’s with the quarter sawn grain pattern? Here are the answers to popular quarter sawn white oak wood questions in our QSWO Q & A.
Q: Why is it called quarter sawn white oak? A: Because of how it’s cut. Quarter sawing means the oak log is cut lengthwise then the halves are turned and cut into quarters. Then each of those pieces continues to be cut in this manner until the desired board size is achieved. 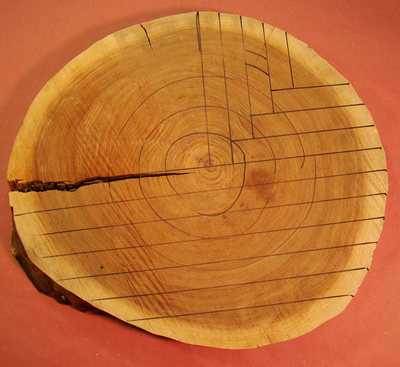 The growth rings of the tree create a straight, linear grain pattern from the cuts. 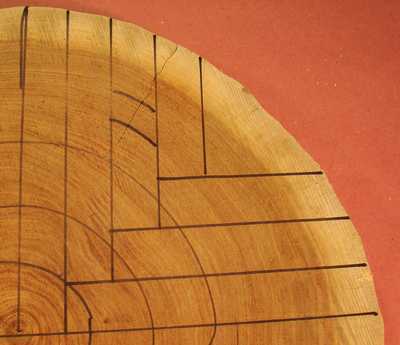 The lower half of this log is marked for plain sawing and the top half for quarter sawing. A close up of the quarter sawing marks. Q: How does quarter sawn oak compare to plain sawn oak? 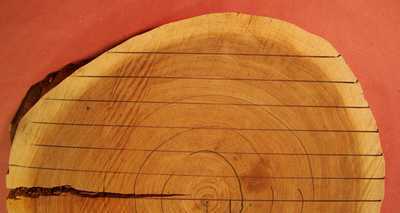 Plain sawn, or flat sawn, involves each log being cut parallel through the log, creating an attractive swirly grain pattern. More lumber can be used from the log with this method of cutting. Plain-sawn lumber costs less and is easier to find, but there’s a risk of it cupping or bowing as it ages. Wood that is quarter sawn is stronger, stable and more resistant to cupping, warping and moisture. Plain sawing allows more of the log to be used. Q: How does the look of quarter sawn white oak differ from regular oak? A: The unique way quarter sawn white oak is cut results in a different grain pattern that’s not as thick as the regular cut pattern of oak. Quarter sawn wood is cut across the growth rings, creating a straighter grain and adding to the stability of the wood. Along with the wood grain, what you see creating a unique pattern on quarter sawn oak wood are medullary rays and flecks. Medullary rays (also known as tiger marks or pith rays) are actually caused by plant cells that allow movement of sap throughout the trunk of the tree, perpendicular to its growth rings and contributing to the growth process. When the cuts are made, the cells create markings that stand out, often in wavy patterns, adding to a decorative nature. The markings are a sign that you’ve received a product made from a high end wood and a lot of labor went into making it. 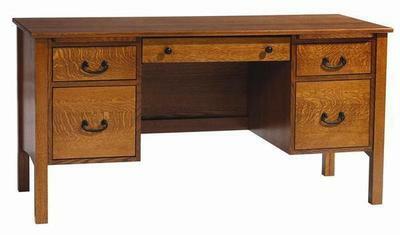 You can pick out the attractive yet unpredictable rays and flecks of the Amish Signature Mission Work Desk. 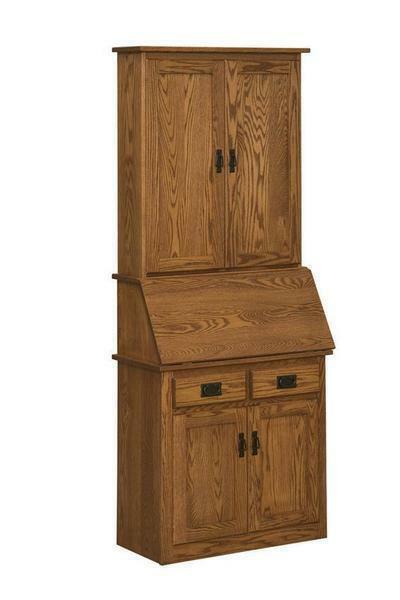 The grain pattern of the Amish Mission Secretary Desk with Full Door Hutch in regular oak wood is thicker. Q: Is quarter sawn white oak wood stronger than regular oak? A: Both are strong, reliable and highly durable. Quarter sawn white oak is even more stable, wears evenly and does offer added resistance to twisting, cupping and warping because of the way it’s cut. This is a desirable feature, especially for wood that is used to craft furniture. 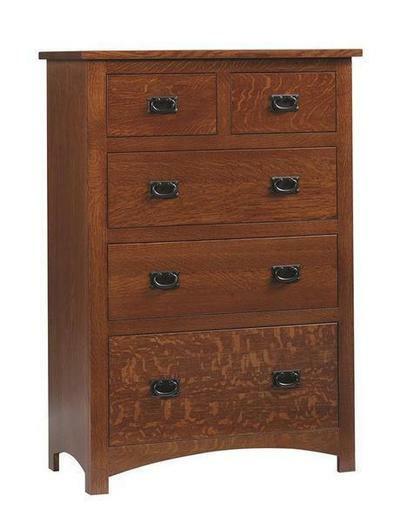 The Amish Siesta Mission Chest of Drawers in quarter sawn oak. 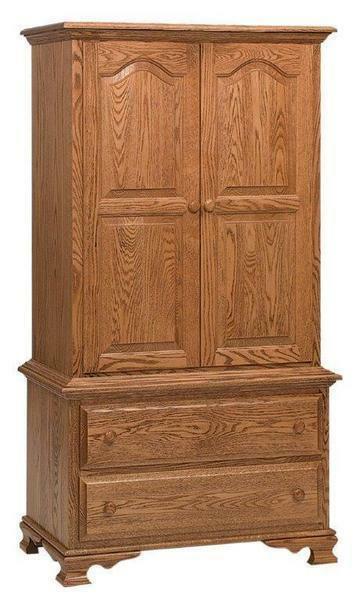 The Amish Heritage Chest on Chest Armoire in regular cut oak wood. Q: What type of furniture is quarter sawn white oak a good candidate for? A: Due to its strength, quarter sawn white oak is a popular pick for furniture that sees daily use. It’s a popular choice for flooring, cabinetry and furniture. We see it used a lot for living rooms and dining furniture. 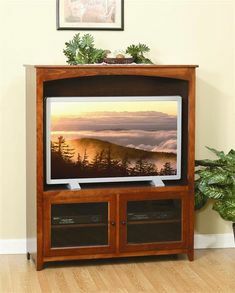 The Amish Lancaster Corner TV Cabinet in quarter sawn oak wood. 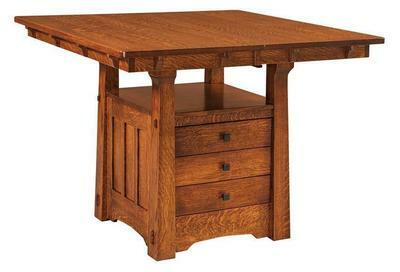 The Amish Beaumont Mission Table with Storage Cabinet in quarter sawn oak. 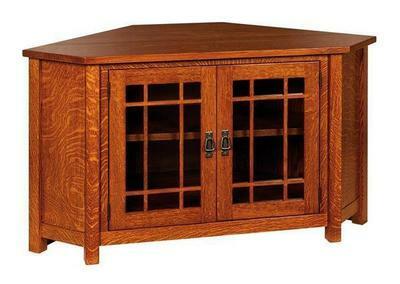 Q: Are there certain furniture styles that quarter sawn white oak is best suited for? 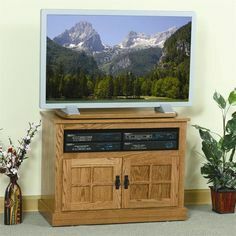 A: Quarter sawn white oak wood is often chosen for shaker and mission style furniture that highlights flat panels so the grain pattern can really shine. 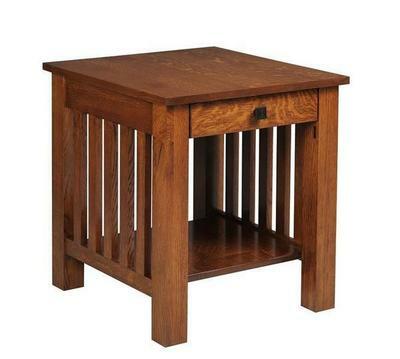 The Amish Goshen Shaker 32″ Coffee Table in quarter sawn white oak. Q: How can I tell it’s quarter sawn white oak? A: Quarter sawn oak showcases varying shades of white to medium brown in its heartwood and sapwood. Because of the way the oak log is cut across the growth rings, the grain is straighter, adding to the stability of the wood. You can always look for the lovely flecks, waves, and flakes in the wood. The medullary rays create a wavy grain pattern with a decorative effect that gives the furniture a unique character. 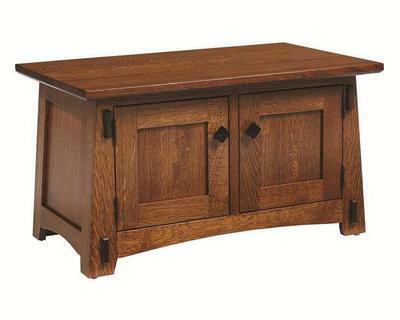 Notice the wavy rays on the drawer of the Amish South River Mission End Table in quarter sawn oak. Q: Which costs more, regular cut oak furniture or quarter sawn white oak furniture? A: Quarter sawn white oak furniture costs more since there’s more labor involved. The intricate cuts require more effort and take more time. Quarter sawing produces less usable lumber per log than plain sawing. 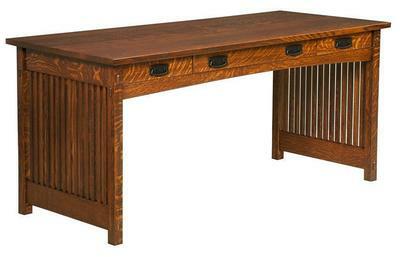 The 60″ Rivertowne Amish Desk in quarter sawn white oak wood. What other questions do you have about quarter sawn white oak? What do you like or dislike about it?